Uncle Scrooge, the world s richest duck, knows exactly where he got every coin he ever earned. 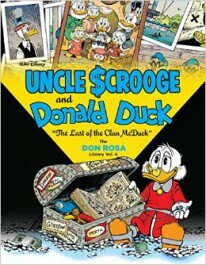 And in this fourth book of Duck epics by Don Rosa, that story begins to unfold at last! Relive Scrooge's Scottish boyhood as Last of the Clan McDuck, then his teenage years as Master of the Mississippi on Uncle Pothole s steamboat! Witness Scrooge's first fights with the Beagle Boys and Flintheart Glomgold and in a bonus Chapter 0, his earliest meeting with Magica De Spell! Presented with brilliant color and a treasure trove of Rosa's cover art and behind-the-scenes factoids, these Duckburg epics are back in a definitive, comprehensive edition for posterity at a bargain price worthy of Scrooge himself!